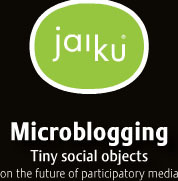 Jaiku co-founder and former Nokia ethnographer Jyri Engeström (bio | Jaiku site) recently gave a presentation on the future of social media, entitled “Microblogging: Tiny social objects” at Reboot 9.0 and at Mobile Monday Amsterdam. Why do people like microblogging? Because most people can’t write several blog posts per day/week but like to keep conversations alive around topics and they like to stay connected with each other in a simple and easy way (accessible through different interfaces and/or devices), including the mobile phone obviously.